Hindu Commonwealth - A fantastic model to revive Grand Bharat. Its time for India to unite everyone on the common principle of Dharma. While the British Commonwealth is a symbol of exploitation and loot under British Monarch, Hindu Commonwealth is a symbol of celebration of Yoga, Culture, Love and Dharma. Commonwealth as a concept was originated to bring together all erstwhile British colonies under a loosely held umbrella of British Commonwealth. It has amongst its members 53 countries who were part of the British empire. It was formed under the Balfour Declaration in 1926 and finally formally constituted by the London Declaration in 1949. Their head is the British Monarch, who is also the symbol of British Commonwealth. The pre-condition of joining or remaining as a member of Commonwealth is to recognize British Monarch as the head of Commonwealth. It’s actually still British Colonialism. There is another position called Chair in-Person which is an elected position from the heads of state of member countries usually held by the host chairperson of the previous Commonwealth Heads of Government Meeting (CHOGM) and is maintained until the next CHOGM. Being a member of commonwealth means that indirectly, the nation still accepts queen as a monarch. This is a fantastic strategy by British Monarch to maintain its control over former colonies. British Monarch doesn’t need a visa to travel to its earlier colonies and in the case of 16 members who are also known as British Realms, she is actually the head of State. This is a fantastic model to revive Grand Bharat. The idea of Hindu Commonwealth has come from the victories of Yushishthir Maharaja, the biggest Samrat (emperor) known to the world. 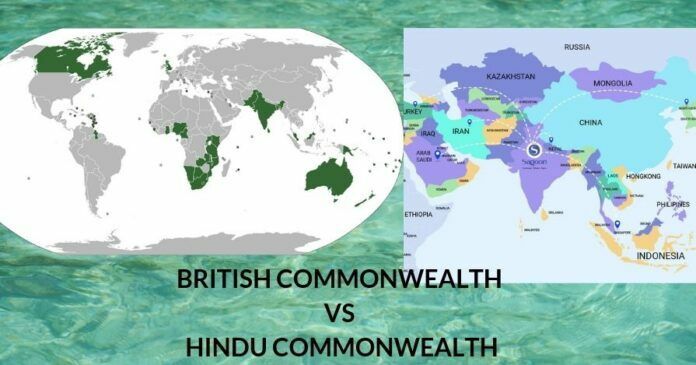 Membership in the Commonwealth is an insult to freedom fighters of large civilizations like Bharat or India. Many scores of Hindu freedom fighters gave up their lives to attain freedom from British monarch. Somehow some misguided political leaders or Brown Angrez of India accepted commonwealth for their own personal interests and ambitions without proper forethought about the future generations. Bharat doesn’t need commonwealth, nor does commonwealth needs Bharat. The issue of Commonwealth is more connected with self-respect as a nation than with any benefits coming out of commonwealth. Its been almost 5155 years after Mahabharat war. There is an interesting episode of Rajasuya sacrifice in Mahabharat war. For those who don’t know, Rajsuya sacrifice is done by emperors after militarily defeating all kings and collecting taxes periodically to establish discipline. In return, the emperor provides military security for the subjugated kings. Using Krishna’s policy, Bhim defeated Jarasandha who controlled 25% of Earth’s land. Through alliances, Jarasandha controlled the whole earth which was inherently under the control of Bhagadath (the Yavana king from middle-eastern areas). After defeating Jarasandh, the way became open for Yudhishthir to perform Rajsuya Yagya. Still, without collection of taxes, Rajsuya Yagya cannot be performed. Yudhishthir sent Bhim to the East, Arjun to North, Nakul to West and Sahadev to the south to conquer and extract taxes. Arjun went as north as Siberia including some lands to the west of Siberia. Nakul went up to today’s Mediterranean sea or little further. Sahadeva went to Rameshwaram and sent Ghatotkach to Srilanka and some other islands to the south and southeast of Srilanka. Bhim went east until the eastern oceans and was also accompanied by his sons as well. They all returned to Yudhishthir with wealth, taxes, gifts for Rajsuya Yagya. With this wealth, Yudhishthir performs Rajsuya Yagya. Many modern countries today fall under the areas which paid taxes to Indraprasth (present-day New Delhi), the capital of Yudhishthir. The idea of Hindu Commonwealth has come from the victories of Yushishthir Maharaja, the biggest Samrat (emperor) known to the world. And he is mentioned by none other than Vyasadev and Ganesh. Hindu commonwealth includes all East and Southeast Asian countries (wrt New Delhi), Most of Russia, CIS, Middle East, Eurasia, Pacific Islands, Pakistan, Afghanistan, Iran, Iraq, Saudi and so on. If India creates an association of countries based on common culture then literally whole Asia, Middle East, and Indo-Pacific will fall into that. This idea is the beginning of the concept of Vasudhaiv Kutumbakam. The common thread of Hindu culture can be seen all over Asia, Europe and it has also been seen carried to parts of Africa and South America. I think Hindu commonwealth is the idea worth following to re-establish Dharmic principles of Joy and Equality which are badly needed in the world today. The world is Hari’s and Samsiddhir Hari Toshanam is the principle. While the British Commonwealth is a symbol of exploitation and loot under British Monarch, Hindu Commonwealth is a symbol of celebration of Yoga, Culture, Love and Dharma. Time has come. At least the discussions should begin. I strongly advise Indian parliament to renounce membership of British Commonwealth. Being a member of British Commonwealth is like rubbing salt to the wound. Its time for India to unite everyone on the common principle of Dharma, that is called Yoga (to reunite). Fooling in the name of Mahabharata? Only great minds think great. You are certainly one to be admired and so is our PGuru channel. Dharma is the future of mankind, not religion. Dharma unites while religion divides as a result of faith and dogma. Such large populations are very difficult to manage. The population of India is no longer uniformly Dharmic Hindu and surrounded by potential aggressors… the Mahabharat occurred when they were all vaguely Dharmic…. so its going to be quite difficult. This the essence of Akhanda Bharata – Akhanda Bharatiya . A great idea when one considers it based on a tradition long lost in antiquity simply because India lost its “soul”. Such thoughts can make a dream but reality of it happening is a far cry from the truth. Yet this dream can become a reality if the place where it all started becomes great again. Indian should show that it has transformed back to its original greatness of the past before such ideas can even gain traction. Leadership has to be through example and India is nowhere near that in its present state. Still it is a great idea! Very wonderful idea to pursue. Should be incorporated into our foreign policy. The articles by u ppl r commendable. Preaching easy practicing needs,big head i.e. Broadminded thinking, compassion, love and care, free from hatred,forgiveness. Long stretched helping hand.we request subramanya swamy, siyer to help us from exploitation, and gross HUMAN rights violations, Constitutional rights,fundamental rights denied.but no response. Why? Happy that you pointed out what common wealth is all about. I have few questions. As per my understanding none of the kids of the Pandavas survived the war. Always include some references. That will be helpful. He is talking about time before the Maha Bharata war. Ghatotkacha was the son of Bhima from Hidimba. He died in Mahabharata war being hit by an arrow from Karna which was meant for Arjuna.